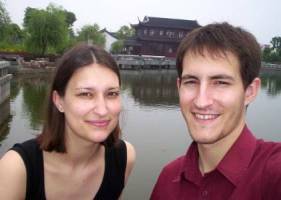 Yann and Isabelle are the two French residents of Yiwu. They settled down here in May 2004, and now offer a wide range of services which include: products, supplier support, the control of the quality of goods, as well as the exporting of goods. Yann: "a real Alibaba cavern"
Yann, how did your Chinese adventure begin? It was in June 2001. I passed a masters degree in public law in Poitiers, France, but I wanted to do business. At that time I was told about the DESS CAAE Euro-Asia (equivalent of MBA in International business, focused on Asian economies), proposed by the Management Institute of Poitiers (IAE). I was so convinced that it suited me that I didn't even apply to any other school... I was accepted and stayed five months in Poitiers, three months in Nanchang (China Jiangxi province) at the Franco-Chinese Management Institute (IFCM), from March to May 2002, then I went to Shanghai where I lived seven months, of which I spent six months as a trainee in a French law firm. When I came back to France, I couldn't help but think about China, but it is not so easy to find a job when you have little experience! Nevertheless, I was offered a job as a purchaser at the beginning of 2004, which I immediately accepted. That is how I came back to China, in February 2004. I discovered Yiwu in December 2003, while I was on a business trip. I had been told that it was a city with many wholesale markets. When I arrived, and when I visited these markets, I really felt as if I was in the Cavern of Alibaba! And all the products proposed in these markets were really cheap! I came back to Yiwu markets several times as a purchaser, then, in May 2004, my girlfriend came to China to join me. I had been so pleased and impressed by the Yiwu markets that I proposed to her that we settle down in Yiwu. What do you do in Yiwu? As a purchaser, I realized that very few services were offered to English-speaking purchasers, and even less for French-speaking purchasers. What's more, even if you speak quite a good English, the Yiwu sellers don't speak English for the most part. Moreover I had been told about the disappointing experiences of several foreign purchasers who had the unpleasant surprise to find bad quality products when they received it, because they didn't have the time to check it when they were in Yiwu. Finally, they were not able to sell their goods. That is how, with my friend, we planned a company project that we have just registered (in January 2005): we have now created a (French) company, but we manage it from Yiwu. We propose to offer a wide range of services to purchasers coming in from all parts of the world: translation thanks to our team of interpreters, following up the orders, payment of the suppliers. We check ourselves the quality of the goods, and then we proceed to all the export-related procedures, we manage the inland transportation and we arrange the shipping. Henceforth, every foreign purchaser will know who to contact before they go to Yiwu (laughs)! Isabelle: "residential areas have appeared in less than one year!" Isabelle, what do you think about Yiwu? What really struck me when I arrived here in Yiwu was the number of public gardens in the city. There are two principle parks along with many others that are smaller in size. But what really surprised me is that the shores of the rivers have been arranged, and some others on the north-east part of Yiwu are being arranged, so that you can stroll from one side of the city to the other while enjoying a pleasant, scenic wander through a park! And what do you think of the people in Yiwu? Most of the foreigners who live in Yiwu come from the Middle East, India, Pakistan, or Korea. There are very few European people here. As a result, Chinese people stare at us as if we come from another planet! One day, we were the innocent party at the scene of an accident between a motorbike and a tricycle with a lot of carton boxes on it. Both riders were staring at us instead of paying attention to what was ahead them (laughs)! At the beginning all these glances were a little bit embarrassing, but with time passing, we get accustomed to it! And now, in our residential area, people have got used to seeing us, and every time we go out we meet big smiles! Yiwu people are adorable! What surprises you most in Yiwu compared with France? Without any hesitation, I answer: the development of the city! It's incredible! Residential areas have appeared in less than one year. The shops have appeared very quickly too. For instance, in our residential area, when we arrived last May, there were only a few shops -not more than four or five. There are more than 15 today, and in the meantime a 15-storey building has appeared! I am also still surprised by the amazing number of two wheels and tricycles. There are so many that the cycling tracks are as large as the main road! Have you met any difficulties because of the Chinese language? It's not easy when you don't speak Chinese to arrive in a city like Yiwu, where even people who are used to sell to international buyers don't speak a word of English! At the beginning, I could only count on Yann to get what I wanted, but now I am learning Chinese, and I have begun to get along by myself! And hopefully, Yiwu people are very patient, and often repeat until I can understand what they tell me!